We are not alone...and Nick Redfern can prove it. Contactees contains the fascinating stories of the select group of people chosen by visitors to Earth to spread their message. Are aliens really among us? Don’t be too quick to dismiss their claims.Truman Bethurum was divorced by his wife because she believed he was having close encounters of a very personal kind with a beautiful extraterrestrial “space captain” named Aura Rhanes. Is he nuts? Prescient? An omen? A band of eerily human-looking, blond-haired aliens—later known as the Space-Brothers—informed other contactees that they were concerned by our warlike ways and wished us to live in peace with one another. Acting on the advice of the Space-Brothers, contactees such as George Van Tassel and George Adamski went out and spread the extraterrestrial word to anyone and everyone who would listen. And many did, including U.S. government agencies. More than half a century later, the contactees are still among us, still telling their tales of personal alien encounters, and still maintaining their cult-like status in the world of UFOlogy. 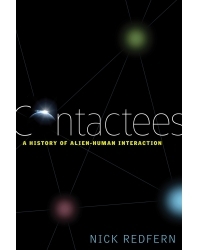 Nick Redfern’s Contactees relates their thought-provoking, lluminating, controversial, and sometimes bizarre stories in all their appropriately out-of-this-world glory. Originally from England, Nick Redfern lives in Arlington, Texas. He is a full-time author and journalist specializing in a wide range of unsolved mysteries, including UFOs, alien contact, Bigfoot, the Loch Ness Monster, government conspiracies, and paranormal phenomena. He writes regularly for UFO Magazine, Fortean Times, Paranormal Magazine, and Fate. His previous books include Memoirs of a Monster Hunter; Strange Secrets; A Covert Agenda; and There’s Something in the Woods. Among his many exploits, Redfern has investigated reports of aliens in Mexico; lake-monsters in Scotland; vampires in Puerto Rico; werewolves in England; and crashed UFOs in the United States.